Product prices and availability are accurate as of 2019-04-07 00:07:10 EDT and are subject to change. Any price and availability information displayed on http://www.amazon.com/ at the time of purchase will apply to the purchase of this product. Japanese Plum Yew, Cephalotaxus harringtonia, Shrub/Tree Seeds Evergreen, Showy Edible Fruits, Shade Lover, Winter Interest, Foundation Plant or Hedge, Cold, Heat and Deer Tolerant Japanese Plum Yew is a coniferous evergreen that typically grows as a shrub to 5 to 10 feet tall, but may be trained as a tree that will eventually rise to as much as 20 to 30 feet tall. It is native to Japan, Korea and Eastern China, where it grows in the forest understory. 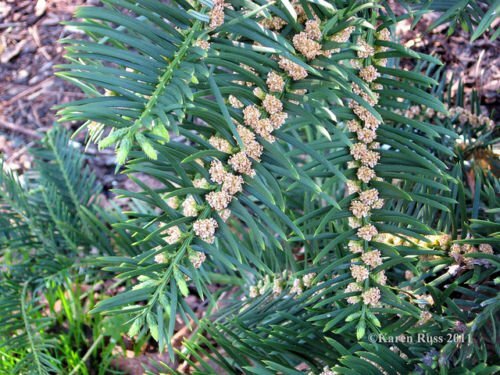 Foliage features linear, spirally-arranged, yew-like, evergreen leaves, to 1.5 inches long, in a v-shaped pattern on erect stems, many of which rise up from the base of the plant. Plants will spread with age. Plum Yews are dioecious. If fruits are desired, female plants with at least one male pollinator are required for fruit production to occur. The ripe fruits, that resemble tiny plums, are edible. The fleshy, plum like fruits are a popular food in Japan, where Plum Yews are cultivated for that purpose. The seeds are about 1 inch long and look a lot like green olives. Plum Yews are slow growers, some taking as long as 10 years for a plant to reach 4 feet tall. Japanese Plum Yew will thrive in a semi-shady to shady position in warm climates but should have more sun in cooler regions. 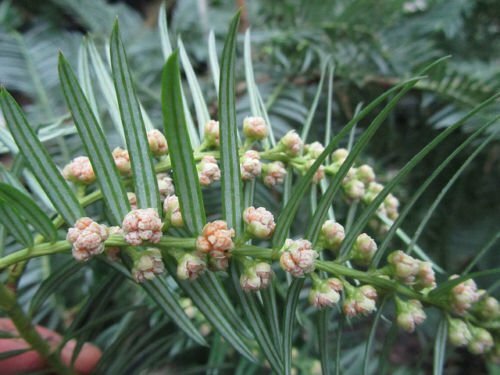 Japanese Plum Yew has the potential to be a very useful landscape plant. 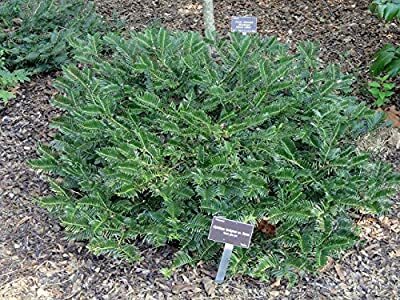 It is more tolerant of heat than the true yews (Taxus), more interesting than most of the Junipers and more tolerant of shade than almost any needle evergreen and deer do not eat it. 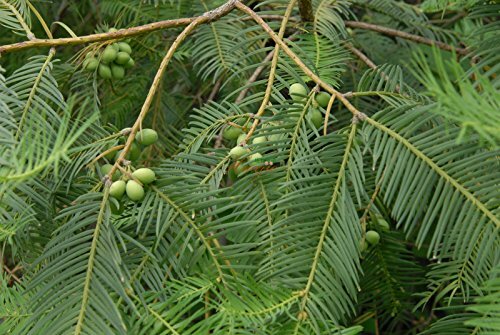 Japanese Plum Yew tolerates severe pruning and makes a good hedge in a semi-shady or even shady area. It is also well suited for foundation plantings. Plants in the genus Cephalotaxus are commonly called Plum Yews because the foliage resembles that of Yews (Taxus) and the fruits (fleshy seeds) on female plants resemble tiny plums. Our seeds/bulbs are guaranteed to be fresh but are NOT guaranteed as to results. Sorry, but there are too many variables in gardening that can impact germination. Flower seeds/bulbs are a live organism. Their germination depends on many factor including heat, cooling, sun, shade, moisture, time of sowing, etc. None of these things We can control so We can not be held responsible for them. So please do not ask for a refund, replacement or to return unused seeds/bulbs.